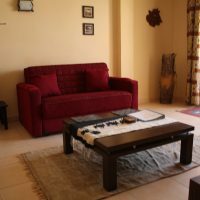 Spacious One Bed Apartment only 5 minutes to Naama Bay in the resort of Goldsharm . Very clean and tastefully decorated newly refurbished fully furnished and ready to move in . Swimming pool free to use. Looking for long term rental would suit working couple or single lady. For more details please contact me through email. This Ad has been viewed 268 times and got 4 replies.